Coordination among our intelligence agencies continued to fall short of our national security needs. In July 1970, having earlier discontinued the FBI’s liaison with the CIA, Director Hoover ended the FBI’s normal liaison with all other agencies except the White House. 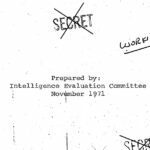 To help remedy this, an Intelligence Evaluation Committee was created in December 1970. Its members included representatives of the White House, CIA, FBI, NSA, the Departments of Justice, Treasury, and Defense, and the Secret Service. The Intelligence Evaluation Committee and its staff were instructed to improve coordination among the intelligence community and to prepare evaluations and estimates of domestic intelligence. I understand that its activities are now under investigation. I did not authorize nor do I have any knowledge of any illegal activity by this Committee. If it went beyond its charter and did engage in any illegal activities, it was totally without my knowledge or authority. Below, you will find declassified documents relating to the IEC. There are currently open FOIA requests with multiple agencies for additional information, and it will be posted here, when released.